Lady’s mantle tea helps in the treatment of menstrual, ovary and uterus problems, as not only modern but also ancient herbalists state, so every woman should have this plant at hand in their home first aid kit. Hot beverage has a beneficial effect on the reproductive health of women, it is recommended after serious surgery, for faster recovery (with the obligatory consultations with professionals). If you drink tea do not add sugar, and you can lose couple of kilograms, regardless of the amount that you drink. Also, lady’s mantle alleviates unpleasant PMS symptoms and will help women in menopause, as well as nursing mothers and pregnant women. The women who are pregnant, can feel free to drink it, without fear for their baby's health. However lady’s mantle is not recommended during pregnancy only if it is combined with other plants, or different tea mixtures, so be wary and on these matters consult your doctor. Yes, soothing lady’s mantle tea has an extraordinary healing and above all preventive actions, and this was known even by our ancestors. Medieval alchemists, for example, collected drops of rain which would be in the middle of its leaves because they believed that it had a different magical and supernatural properties. Lady’s mantle, Latin name Alchemilla vulgaris is an ideal choice for women, and its name derives from the Arabic word alkimiya, which in our language means "cure all diseases" - which is also appreciated in Phytotherapy. Lady’s mantle tea in traditional and folk medicine was present for hundreds of years. The plant itself belongs to the family of roses and has over 300 relative plants around the world. It grows on the edges of forests, especially in the slightly higher mountain regions, and can be found along the roads, as well as on the slopes and wet meadows. Underground tree of lady’s mantle is diversified, and the above-ground part of the plant can grow to 40 centimetres in height. 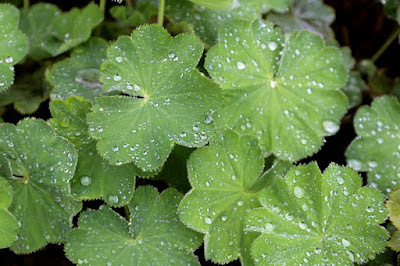 Lady’s mantle has alternating leaves that are slightly larger on the handles, and in general are rounded and broken down into 7-11 shallow lobes, which are covered with smaller hairs. The lady’s mantle flowers have a specific yellowish-green colour and bloom from May until August. In phytotherapy the aboveground parts of the plant are used, and to a lesser extent only leaves, which are for the most part quite bitter and have an astringent taste. The plant contains glycosides, tannins, flavonoids, ellagic acid and important essential oils, which have a beneficial effect on our body by toning down any inflammation of the skin or mucous membranes. Lady’s mantle has been used for hundreds of years to treat painful and prolonged menstrual periods, and according to the world-famous and foremost recognized herbalist Mary Treben it has a very beneficial effect in the cases of the so-called excessive discharge or white washing and other genital problems. Along with yarrow it can regulate completely irregular menstrual cycles during puberty in young girls. Mix 50 grams of lady’s mantle and raspberry leaf with 25 g of lemon balm, and of the whole mixture take one tablespoon and pour with half a pint of water that has just boiled. Close the container and wait at least thirty minutes for tea mixture to sit. After that filter it and immediately drink. You can take three large cups of the beverage within 24 hours. For all forms of cysts on ovaries try lady’s mantle and yarrow tea, which is recommended by renowned herbalists. Mix equal parts of lady’s mantle, yarrow and calendula, and three tablespoons of the mixture pour with a litre of boiling water and leave it covered for half an hour to rest, and then you need to filter it. You can drink up to three cups but only for a few days, when you need to take a break. Unlike most other herbs that are used in teas, pregnant women can drink it without fear and as much as they want from the third month (the first trimester). Lady’s mantle is good also after childbirth, during breast-feeding, because it strengthens the immune system, you can drink it if you suffer from dry throat. In addition to the above-mentioned medicinal tea, pregnant women are recommended to use the healing bath. Soak 200 grams of lady’s mantle in cold water and let it stand overnight and in the morning warm a little, but strain and add to the prepared bath. Pour a small teaspoon of lady’s mantle with half a pint of boiled water and leave it for 20 minutes to rest. Filter well and dose a maximum of two to three cups of tea a day, at least ten days after the childbirth. Lady’s mantle tea can be of great help in the fight against obesity. A study published in October 2008 in a popular scientific journal "ECAM Advance Access" reveals that the leaves of this plant are used as a natural treatment for the regulation of body weight even in traditional Arab medicine. Intrigued by the idea that the lady’s mantle tea for weight loss is more than successful, and that its reputation in this segment is inviolable, a team of researchers decided that the whole matter should be investigated in detail. Results of the study were positive, because the effectiveness of the herbal mixture containing extracts of lady’s mantle, cumin, mint leaves and olive wood showed very good results. The investigation lasted for three months, during which as many as 66 obese subjects consumed the said mixture. On this occasion, it has been proved that lady’s mantle and leaves of olive trees accelerate the process of burning body fat in all subjects, while the mint and cumin prolong the feeling of satiety while stimulating digestive enzymes. In the vast majority of patients the improvement was noticed, even in those critical subjects. This detailed three month research, clearly made it clear that lady’s mantle tea prepared in this way, affects the weight loss. In what cases did lady’s mantle prove effective? For problems with ovarian cysts. In the cases of inflamed ovaries (ovaritis). In case of increased risk of miscarriage and at-risk pregnancies. The prolonged symptoms of PMS. During climax, expressed with hot flashes (hot flushes in menopausal women). The inability to conceive (use tea mixture with valerian). The presence of vaginal (bacterial or viral) infection. For fibroids, the presence of ulcers and other serious gynaecological problems. For dry throat and pharynx when it is necessary to drink it warm. Lady’s mantle tea is prepared as follows: Mix 25 grams of lady’s mantle, pumpkin seeds, chamomile and thyme, and three tablespoons of this mixture pour with half a litre of boiling water, let it stand through the night. In the morning strain and drink in small sips. Wash and drain a handful of fresh lady’s mantle then mash with a rolling pin and gently put on the painful area. It is recommended in cases of burns, insect bites or skin irritation. In 100 ml of heated wine insert a handful of freshly picked lady’s mantle flowers. Mix equal amounts of lady’s mantle and valerian, and a small spoonful of the mixture pour with two decilitres of boiling water and leave it covered to rest, not less than half an hour. Filter and slowly drink three cups of tea a day for three months, with breaks during menstruation. Pour 200 grams of lady’s mantle in glass jar and pour homemade brandy (60% alcohol), and leave in a warm and sunny place to rest for three weeks, occasionally shake it. In cases of internal bleeding drink 10-15 drops in a cup of water, twice a day. We believe that you learned how lady’s mantle is useful and effective for our health, if you have any female problems, be sure to have it on your shelves.